Trudie Moore was born in the U.K. in 1953, Trudie has always had art in her blood. Inspired by her uncle Ted who was a brilliant sketch artist, Trudie worked hard developing her drawing skills in high school towards her art and design CSE, spending many lunch hours sketching. Her A2 sized lino-cut of a corn-on-the cob was chosen from hundreds of entries, to be included in a national exhibition of student works at the Royal Academy of Art London where it was on prominent display for several weeks. Trudie had private tuition painting landscapes in oils, with respected artist Peter Golding. 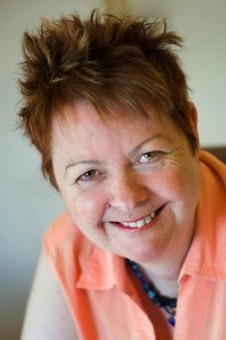 She migrated to Australia in 1978 and worked in the public relations office of Sydney University. Forming an association with a local art gallery in Glebe Point Road, in 1981 she had an exhibition of 30 works in scraperboard. Her love of oil painting remained, and through a weekly painting group, entered a landscape into a local art show winning second prize. In 2003 she was introduced to the world of Encaustic art, and a great love affair using beeswax as a medium began. Trudie has entered her wax paintings in local exhibitions and had articles published about encaustic art ,in national magazines. After making greeting cards for friends, and applying wax onto gloss card, Trudie experimented and developed painting with wax on canvas, and is becoming in popular demand for her unique paintings. Painting with wax can be traced back to ancient Greece and is mentioned in early Roman texts. Among its many uses were for portrait painting, relief panels, and to colour marble.